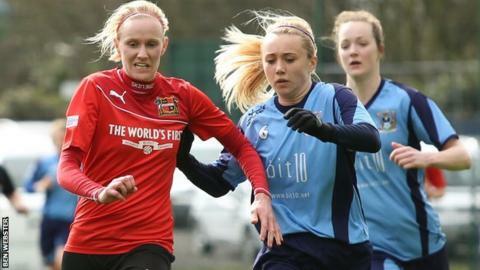 Sheffield FC Ladies have won the Women's Premier League Northern Division and are now one win away from promotion to Women's Super League Two. This was confirmed when second-placed Coventry City LFC decided not to appeal against a decision to deduct them six points for fielding ineligible players. Sheffield will now face the WPL's Southern Division winners, Portsmouth, in a play-off on Sunday, 24 May. Only one third-tier team can go up, provided they meet certain FA criteria. Both Sheffield and Coventry have one match remaining in the league this season, but the Yorkshire club are six points ahead. A statement on Coventry City Ladies' website said: "The board would like to thank all those that so generously offered legal support and expertise in defending our case; regrettably we have simply run out of time. "We would also like to take this opportunity to congratulate all at Sheffield FC on retaining the Northern Division title." Sheffield have won 18 of their 21 league games so far this season, winning all 11 of their home games.